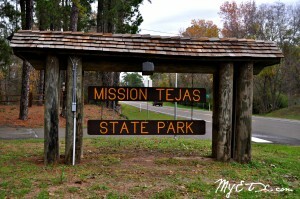 Weches, Texas- Mission Tejas State Park will have outdoor fun on tap throughout the month of June! These events are informative and fun for the whole family. Get outside and enjoy beautiful East Texas! June 6, 2015: Fish with a Ranger! Let’s kick off National Fishing Week together! Join a ranger and learn the basics of fishing and then try your luck. We’ll be providing fishing poles and bait for those in attendance! So just bring yourself, your family, and some friends and enjoy a morning of fishing for fun. 10:00am until 12:00pm at the pond. Bring water, sunblock, a hat, bug spray and a camera to catch your memories! No fishing license required. 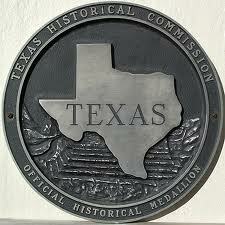 2:00pm until 3:00pm: The Story of Mission San Francisco de las Tejas! Meet at the Mission and prepare to step back in time hearing the story of Mission San Francisco de las Tejas and the people associated with it. Bring a camera, your curiosity, and a willingness to learn! June 7, 2015: Nature Hike! Join a park ranger along this nature trail observing pond life and exploring the forest. We will meet at the Pavilion at 2:00pm. This is an easy hike that is less than 1 mile long and should take about an hour. Bring water, bug spray, a camera if you want, and comfortable shoes. All programs are free, there is a $2.00 park entry fee for all 13yrs and older. We are located on Hwy 21 between Crockett and Alto. Please call 936-687-2394 with any questions. June 13, 2015: Basic Outdoor Photography! Learn basic outdoor photography tips from an expert. Bring a point & shoot or DSL camera. Check in at the Headquarters building for the meeting point. This class meets the second Saturday of each month at 2:00pm. June 20, 2015: The Story of Mission San Francisco de las Tejas! Meet at the Mission and prepare to step back in time hearing the story of Mission San Francisco de las Tejas and the people associated with it. Bring a camera, your curiosity, and a willingness to learn! 2:00pm until 3:00pm at the Mission. 7:30pm until 9:00: Join Ranger Josh at the Pavilion for a look into the wonderful and mysterious world of owls. We will discover whooo’s who in the world of nocturnal predators here at the park and throughout Texas. This program is for all ages, bring bug spray and a flashlight. June 21, 2015: Nature Hike! Join a park ranger along this nature trail observing pond life and exploring the forest. We will meet at the Pavilion at 10:00am. This is an easy hike that is less than 1 mile long and should take about an hour. Bring water, bug spray, a camera if you want, and comfortable shoes. June 27, 2015: Geocaching! Learn to use a GPS unit to find hidden treasure. This is a great activity for all ages, no experience needed! Bring your own GPS unit or borrow one of ours. Meet in the picnic area at 10:00am, this program will last about 1 ½ hours. 2:00pm until 3:00pm: Rice Family Log Home Tour! Meet at the Rice Home for a tour and discussion about early settler life in East Texas. We will discuss similarities between their lifestyle and our modern lifestyles. Bring a camera and bug spray. June 28, 2015: Nature Hike! Join a park ranger along this nature trail observing pond life and exploring the forest. We will meet at the Pavilion at 10:00am. This is an easy hike that is less than 1 mile long and should take about an hour. Bring water, bug spray, a camera if you want, and comfortable shoes. All programs are free, there is a $2.00 park entry fee for all 13yrs and older. We are located on Hwy 21 between Crockett and Alto. Please call 936-687-2394 with any questions. PALESTINE- Palestine Main Street will join the Anderson County Historical Commission, Sat., May 12, 2012 at 10:30 a.m. and then again at 1:30 p.m. for two unveiling ceremonies in the Main Street District. 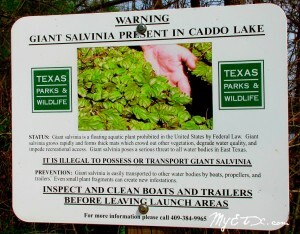 ATHENS—Giant salvinia, a non-native invasive aquatic plant, has been found at several lakes around East Texas over the past few months, leading to concerns over how quickly the destructive plant is spreading. PALESTINE – The 76th Annual Texas Dogwood Trails Celebration in Palestine, Texas takes place the last two weekends in March and first weekend in April. Since 1938, locals and visitors alike have been enjoying the delicate white blooms of the Cornus florida, commonly known as the flowering dogwood. 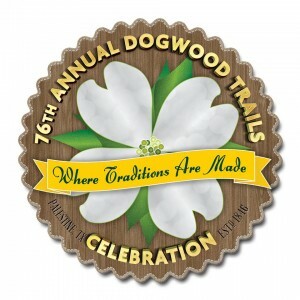 Activities are scheduled each weekend to compliment the long time Celebration, including the Dogwood Festival set for Sat., Mar. 22, 2014 from 9 a.m. – 4 p.m. in historic downtown Palestine. How Many Tomatoes Can You Eat at Tomato Fest?